NEW!!! WOMEN 4 WOMEN WALKING RETREATS: six spaces left!!!! Future fundraising: once ideas have been discussed and approved by the local women, we go ahead with making them a reality! Will it be a creek powered flour mill? A couple of mules to carry flour and produce to the market? This inaugural 11 day Women 4 Women Walking Retreat AND Pike Peak climb ( 4065m) is for women like you who want to take time out to contribute to the conversation with local women, help them with their business, health and life aspirations, as well as reflect, recharge and define/refine their professional and/or personal direction. Our fully supported Trek is run by Friendship World Trek and Expeditions and will be escorted by world-famous Australian Everest Summiteer, the unconquerable Brigitte Muir OAM who turns 60 this year and is ready to party. Brigitte was the first Australian woman to climb Mt Everest, and the first Australian, male or female, to climb the highest peak on each continent. She has led countless treks and mountaineering expeditions to the Everest Region of Nepal. She knows the people, villages, paths and sites very well and has established a community program for local women in Lura (Beyond The Smile). We are so lucky to be able to meet and learn from these local Nepali women who we will work and plan with during the trek. The Authentic Woman Coaching Program including pre-trek preparation, facilitation of all group discussions, one-on-one coaching and post trek planning sessions will be led by professional Women’s Coach, and Facilitator, author and fellow adventure traveller, Juliette Robertson. Juliette has lived a richly diverse life. Now in her 50’s, she is a senior Learning and Development Consultant, and professional Coach and Mentor to women from corporates to small business. Juliette has travelled the globe, much of it solo on adventurous expeditions and has recently launched her 3rd book, a travel memoir ” One Spanish Summer and other stories from the Road”. She is a wife and working mother of two teenagers and a lifelong student of personal development – finding one’s purpose and taking action. She loves writing, dancing and creating the space where people work together to do extraordinary inspiring things. Private groups: I can design and lead your special destination trek according to your very own vision and wishes! Also: Our yearly Well Being Well Doing Trek: 3 to 15 February 2019. Maximum of 8 participants. US$2780 per person, ex Ktm. No other trek like it! Is this the Valentine day Present you have been waiting for? Treat yourself or your loved one! Valentine’s Day in Kathmandu on Day 14..
Busy smiling. Tihar Festival, Lura. BE QUICK! FOUR SPACES LEFT ON THIS ONE! 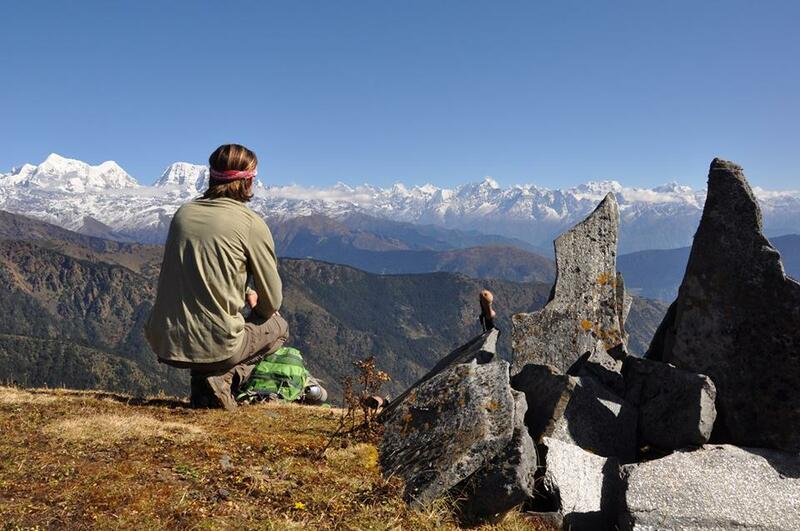 I worked with Robyn Stephens to create this one off yoga trek in order for you to share my love of the culture, landscape and people of Nepal, with a combined walking & Yoga experience suitable for anyone with a sense of adventure. For the yoga part of your experience you will be will be in the hands of Robyn Stephens who has been practicing yoga since she was 20 years old and has been teaching Yoga continuously since 1995. Robyn is a qualified yoga therapist and a registered senior Yoga teacher. April 2019 is a special time for Robyn as she turns 70 on the second day of the trip. Robyn recently trekked in South America, Japan, and New Zealand. Before New Zealand she did a lot of strength and stamina training to overcome weaknesses shown up in previous trips and it paid off. This trip she hopes to inspire others to let go of self-imposed limitations, and to assist with pre walk training. HOW FAR AND HOW HIGH? Most of the trip is in moderate and manageable altitude. Kathmandu is only 1,320 metres above sea level. Some people may get mild altitude symptoms over 2,500 metres. Our highest group stay is at 3,500m which is 1,800 metres lower than Everest base camp. We walk a maximum of 6 hours per day with plenty of rest between, and because our trip is fully supported, we only carry a light day pack with basic essentials for the day. This makes travelling much easier.